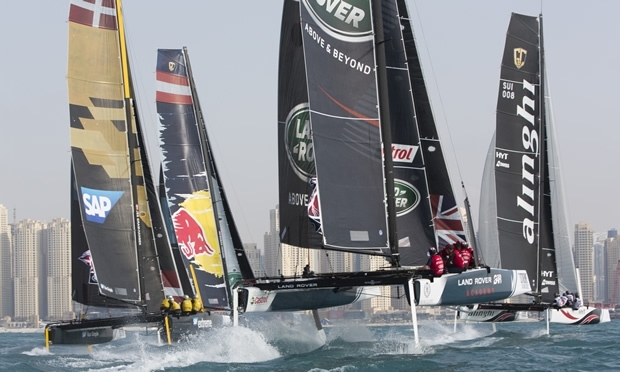 For the first time in its 10 year history the Extreme Sailing Series is set to go foiling as the 2016 season kicks off in Muscat in one week’s time. Eight teams from 14 different nations, return to the Almouj Golf Course, Oman over 16-19 March. The new season marks not just the introduction of high speed foiling on GC32 catamarans, but also innovations in race format including a new coastal race and match racing, that complement the core proposition of the series, its stadium racing format. On 16 March the boats will race in front of historic backdrop of the Old Town in Muscat before returning in a 20 km coastal race, to Almouj, in the first race of this duration in Extreme Sailing Series history. With crews made up of elite level sailors, boasting 20 Olympic campaigns, 31 America’s Cup campaigns and 45 World Championship titles, the competition is set to be fierce. Among the contenders will be returning champions Alinghi, skippered by Ernesto Bertarelli, looking to claim a third championship title. SAP Extreme Sailing Team, runner up in 2015, will be hunting for their first overall title, while the always-competitive Red Bull Sailing Team will be back with one of the most experienced skippers on the helm in Roman Hagara. Following his success in 2015, Leigh McMillan, former skipper of The Wave, Muscat, will also be back on the water in Oman. However this time he will be on board with the Land Rover BAR Academy youth team crew, helping these talented youngsters, including skipper Bleddyn Môn, learn the ropes. For the first time in the Series’ history a Portuguese team, Sail Portugal, will be on the starting line, skippered by Diogo Cayolla. The team includes three-time America’s Cup sailor and current SoftBank Team Japan crewmember, New Zealander Winston Macfarlane, who will bring with him vast amounts of sailing knowledge as a Team New Zealand veteran. Alister Richardson, will further boost the Team Turx line up, as a former Extreme Sailing Series champion, and America’s Cup sailor. Although some teams, such as Alinghi, already have the advantage of having completed a full season in the GC32, Graham still believes the Stadium Racing format will spring surprises. “Initially experience may be an advantage but what nobody knows is how the boats will perform in the unique stadium format of the Extreme Sailing Series. The short legs make the tactics in a foiling boat very different to any other form of racing. The stadium racing is almost a different discipline in itself,” he said. The action starts on Wednesday 16 March with coastal racing in front of Muscat’s Old Town before the teams commence battle in the Stadium on Thursday 17 March. The eighth and final team will be announced in the coming week to complete the starting grid.